Vice Chairman of Hyundai Asan Kim Yun-Gyu, the pointman who spearheaded Hyundai Business Group's projects in North Korea, is now under pressure to resign from the Hyundai Group. Christian Broadcasting System(CBS), a local radio and cable TV network, reported on August 8, 2005 that Vice Chairman Kim had been under surveillance for his "personal irregularities" from the group. 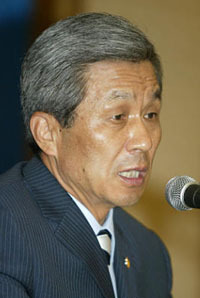 Kim has been in charge of all the North Korea-related projects within Hyundai Group. Hyundai Group also announced August 8, 2005 that starting at the end of June it began special inspection on the North Korean projects of Hhundai Asian, Hyundai's legal entity set up to take care of all the North Korean affairs. This inspection has been conducted on the order of Hyun Jung-Eun, chairwoman of Hyundai Group, also the wife of the late Chairman Chung Mong-Hyun. In particular, this inspection is focused on the personal irregularities of Vice Chairman Kim. A Hyundai source also said on the same day that the launching of the inspection was started. The source added that it is up to Vice Chiarman Kim to feel the pressure to resign or not. "The inspection on Vice Chairman Kim took place at a sensitive time when Mt. Baekdu and Gaeseong is about to open to South Korean tourists," a high-ranking official of Hyundai Asan was quoted as saying. Vice Chairman Kim Yun-Gyu was the one hand-picked by the late Chairman Chung Mong-Hun to run Hyundai's North Korean businesses and he left a will for this. Chung Mong-Hun committed suicide in August 2003 when he was under investigation from the prosecution in regard to the alleged supplying for the political fund. His wife, Ms. Hyun Jung-Eun, who took charge of Hyundai Group after Chung's death, met with North Korean leader Kim Jong-Il from July 12 to 17 and reached an agreement with Kim on opening Mt. Baekdu and Gaeseong City to South Korean tourists within this year.